Supplements have been revealed for the acclaimed fantasy thriller from Norwegian filmmaker André Øvredal planned for Blu-ray release this August. 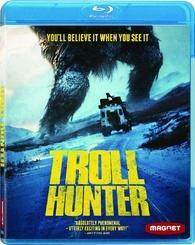 As previously reported, Magnolia says 'Troll Hunter' is coming to Blu-ray on August 23. 'The Troll Hunter' is the story of a group of Norwegian film students that set out to capture real-life trolls on camera after learning their existence has been covered up for years by a government conspiracy. A thrilling and wildly entertaining film, 'The Troll Hunter' delivers truly fantastic images of giant trolls wreaking havoc on the countryside, with darkly funny adherence to the original Norwegian folklore. Specs have yet to be revealed, but supplements include Making-of Featurette, Deleted Scenes, HDNet Special, and International Trailer. You can find the latest specs for 'Troll Hunter' linked from our Blu-ray Release Schedule, where it's indexed under August 23.